WRITERS AND CARDSLINGERS! ARE YOU READY FOR NATIONAL NOVEL WRITING MONTH!? 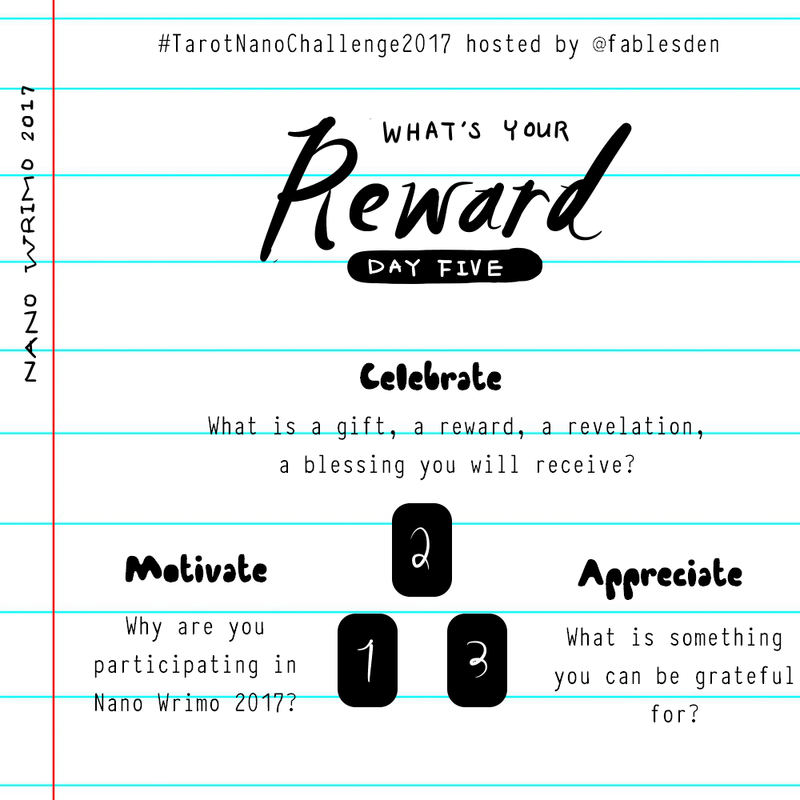 For this year, I will be hosting a 5-Day Tarot Nano Challenge #TarotNanoChallenge2017 on my Intsagram @fablesden. I have created 5 tarot spreads that will help you jumpstart your creativity, boost productivity, convey your message and identity as a writer, keep up the hard work and pace, and keep your eyes on the prize. They are mostly 3-4 card spreads, and are designed to be short and sweet. A spread that you can quickly do even if you’ve had a busy day. Spreads that are tools + that you can return to when you are in need of a power boost in the next 31 days. Most of the spreads and challenge prompts I have created this year are most focused on the “meta” stuff. If you are looking for tarot spreads and resources that are more tailored towards concepting, worldbuilding, character-crafting and theme–check out the Imagination Station Quest Page! It’ll lead you to list of resources, blog posts and tarot spreads and feel free to browse through all the tarot writing posts that I have written in the past years. Also, I recommend checking out Ciaran’s Tea is for Tarot website. She’s hosted a 14-day Tarot & Writing Challenge on her Tumblr site, with super comprehensive and detailed prompts that will take you from the beginning of your writing journey to finish. I’m slightly on the fence about participating in Nano because I have so much work to do still for November, but I haven’t written fiction in a while and I really miss the thrill–getting lost in the world I’ve created, spending time with my characters, and embarking on an adventure with them. I have a couple of ideas that are calling to me, waving their little hands at me, begging to be picked. Maybe I’ll write all of them, who knows. I’m about 80% sure that I am going to be writing something. I don’t think I have enough time to write a novel, though. A short story or two. Here are the challenge prompts + spread pics!